Today’s your lucky day, because today the Nootropic Geek (that’s me!) has officially given you permission to load up on fats. In case you didn’t know, your brain is a total fatty. A significant percentage of your is comprised of fatty acids, which is why completely eliminating fats from your diet tends to make you a little… well, crazy. (And cranky.) Bulletproof Smart Mode knows this, which is why they’ve included their staple Bulletproof coconut oil: Brain Octane®. However, unlike the Brain Octane Oil supplement, this formula comes in capsule form (not liquid). Does this have a substantial difference on Bulletproof’s oily benefits? Also, what about the other ingredients in this stack — are those any good, too?? Let’s read the Bulletproof Smart Mode review to find out. Who Takes Bulletproof Smart Mode? Conclusion: Does Bulletproof Smart Mode Work? 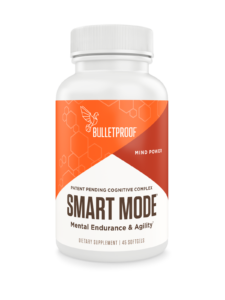 Bulletproof Smart Mode is a Mental Endurance & Agility nootropic brain health supplement that features the staple Bulletproof Brain Octane oil. One part cognitive enhancer, another part cognitive extender, Bulletproof Smart Mode places equal emphasis on short- and long-term brain boosts. 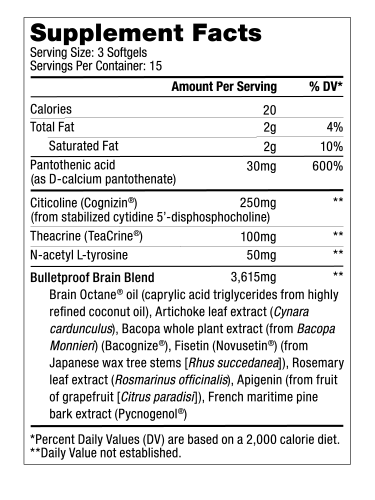 While the dosage looks good, the Bulletproof Brain Blend goes the proprietary route, obscuring the individual ingredient dosages, which is annoying. Also, the low serving size count per bottle diminishes the overall value of this supplement. Other Ingredients: Gelatin, purified water, glycerin, beeswax, sunflower lecithin, colored with annatto, natural flavor. Directions: Take one serving (three softgels) daily to support cognitive performance. Pantothenic Acid – Vitamin B5 is essential for general health, yet we’re rarely deficient in this vitamin. I’m thinking that vitamin B6 or B12 would have been better here, but I’ll take this all the same. More on B Vitamins. Citicoline (Cognizin®) – A solid dose of an awesome cholinergic nootropic. Citicoline is one part choline, another part cytidine, the precursor to nucleotide uridine. Together, these bonded compounds seem to improve acetylcholine activity and brain energy levels. More on Citicoline. Theacrine (TeaCrine®) – This caffeine-like compound seems to deliver caffeine-like effects, having a sedative effect at lower doses and a stimulatory effect at higher doses. Rarely do I see this ingredient not paired with caffeine (as is the case here). N-Acetyl L-Tyrosine – An awesome anti-stress amino acid, N-acetyl L-tyrosine helps sustain mood, motivation, and focus under conditions of stress and fatigue — although, this 50 mg dosage isn’t all that great. More on L-Tyrosine. And now onto the proprietary blend. Bulletproof made a name for itself by introducing coconut oil to coffee. Brain Octane® Oil – The staple Bulletproof oil, potentially improving cognitive energy, clarity, and long-term brain health with its oily goodness. 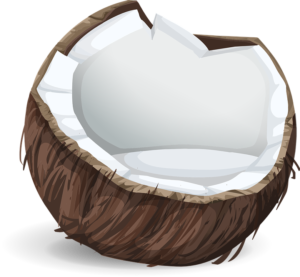 Brains need fats, and these fats seem to fit the healthy brain bill. Artichoke Leaf Extract – An interesting ingredient here. Artichoke extract may have cAMP amplifying benefits, potentially improving synaptic plasticity (i.e., neuron growth). Bacopa Extract (Bacognize®) – Who doesn’t like Bacopa monnieri? This is one of the most popular herbal nootropics, and for a good reason: Bacopa helps many aspects of mental performance, including memory, learning, and stress resistance. Bulletproof Smart Mode gives us the potent, premium stuff (Bacognize®). More on Bacopa Monnieri. Fisetin (Novusetin®) – Essentially a dietary antioxidant (highly concentrated in strawberries) for genera health promotion. May help reduce “aging” oxidative stress, giving this formula a neuroprotective edge. Rosemary Leaf Extract – May possess anti-inflammatory compounds, preserving brain health and function against harmful inflammation. Apigenin – Associated with chamomile, apigenin seems to be a sedative, anti-anxiety flavonoid. May also reduce free radical damage. French Maritime Pine Bark Extract (Pycnogenol®) – Another highly concentrated source of antioxidant neuroprotection, maritime pine bark extract seems particularly beneficial for reducing the symptoms of attention disorders. However, knowing what we know now about antioxidants and their “anti-aging” resistance to free radicals, I think it’s smart that Bulletproof Smart Mode places such a heavy emphasis on antioxidant ingredients. And it’s doubly smart that Bulletproof Smart Mode places a similarly heavy emphasis on nootropics that enhance cognition now. Notice that overlap between now and later ingredients? (Citicoline, Bacopa, Maritime Pine Bark Extract?) To me, this equal focus on cognitive enhancement and cognitive longevity qualifies Bulletproof Smart Mode as a genuine nootropic supplement. Granted, it’s not perfect: the NALT could use a higher dosage, and the proprietary status of the blend is annoying for obscuring the individual ingredient dosages. Also, only 15 servings per bottle? WTF m8?? 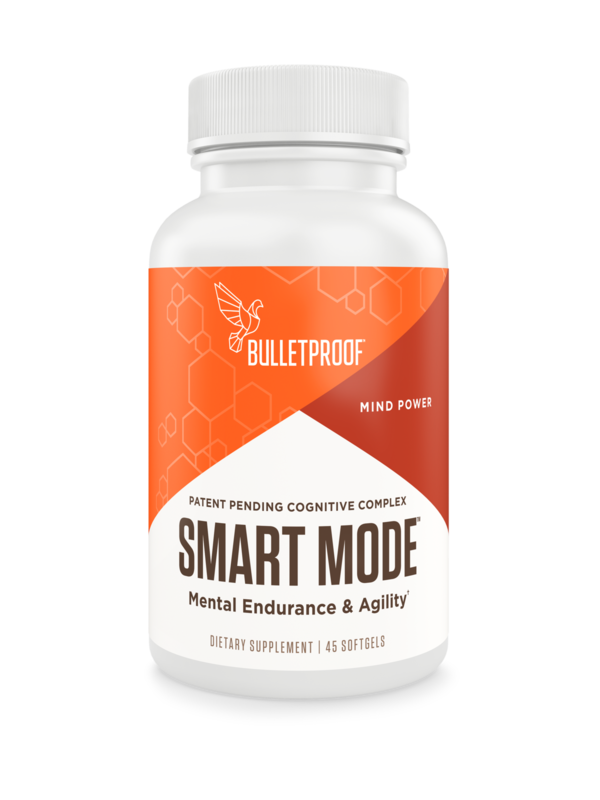 Even so, Bulletproof Smart Mode supplies an impressive, high quality nootropic formula that works for short- and long-term cognitive performance. Bulletproof Smart Mode demonstrates an impressive diversity of nootropic bio-pathways, covering both immediate and long-term brain health benefits. For the most part, the ingredients are all exceptionally potent and of premium quality. The particular emphasis on oily, antioxidant, anti-inflammatory ingredients is unique, making Bulletproof a true contender in the nootropic supplement game. The NALT dosage could be substantially improved. Proprietary blends obscure ingredient dosages, which is very rarely a good thing in my estimation. Only 15 servings? And you want me to pay how much?? I pulled the pricing above from the Bulletproof online store. However, at time of writing, the store pretends to sell the supplement at the “discounted” price of $44.76. (I say “pretends” because there’s no indication that this supplement is sold at $55.95 anywhere else.) If you buy with the Subscribe & Save (5%) option clicked, you may receive Bulletproof Smart Mode at a designated time interval for $42.52 per shipment. There’s a hipster edge to bulletproof coffee. I enjoy bulletproof coffee primarily for its taste. (And the local cafe that makes their own version of bulletproof coffee makes it extra buttery.) Bulletproof Smart Mode might attract a similar hipster crowd; however, I would use this supplement as a substitute to the liquid Bulletproof oily supplement. This one sits more in the capsulated nootropic realm. At time of writing, the only place you can buy Bulletproof Smart Mode is through the online Bulletproof store. No Amazon or GNC or other retailers; even though Amazon sells other Bulletproof products. (Which indicates to me that we might see this bad boy up there soon? All in all, Bulletproof Smart Mode is a pretty impressive brain health nootropic stack, one that places equal emphasis on brain health as it does brain function (or cognitive performance). You may appreciate this supplement stack both for its long-term health benefits as well as its “immediate gratification” brain boosts. Really, it’s a brain booster through and through; although, if you’re hung up on its proprietary blend shenanigans or low serving count, then I recommend comparing this stack to the other awesome stacks on my Best Nootropic Supplements of 2018 list.